The index opened positive above 7400 and saw buying interest from the morning to move to the highs of the day at 7504, but huge profit booking saw the index nosedive more than 234 points to the lows of the day at 7269. Some lower level short covering saw the index close at 7359.05, a small loss of 8.05 points. The broader market was very negative, with 534 advances to 1056 declines. Expected range till Expiry seems to be 7000-7500. 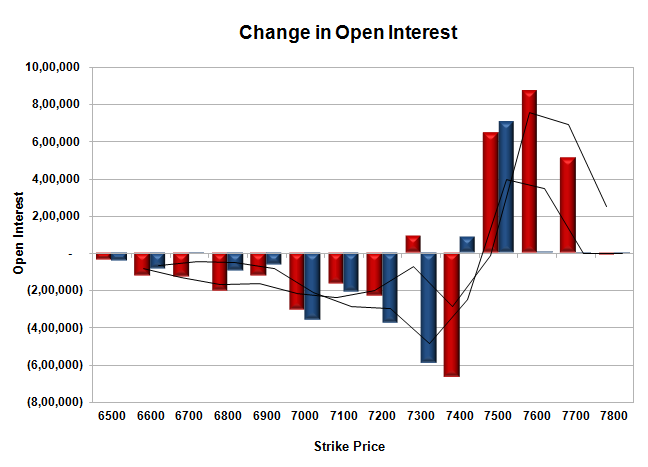 Call option 7300, 7500-7700 added 21.25 lacs huge amount of OI with short covering seen at 7200 and lower strike prices. Put option 7500-7400 added 7.90 lacs huge amount of OI with profit booking seen at 7300 and lower strike prices. Nifty Open Interest is at 1,91,46,900 down by 18,79,100, whereas June series added 16.12 lacs with small decrease in price, mostly rollover with some long liquidation. Bank Nifty Open Interest is at 26,89,025 down by 2,22,425, whereas June series added 1.22 lacs with decrease in price, mostly rollover with long liquidation. FII’s bought 4.30 lacs Futures, mostly short covering as their net OI decreased by 4639 contracts (includes 165605 longs to 156996 shorts for the day) and the average price per contract comes to around 7394.97. FII’s future open contract as on date is 527362. 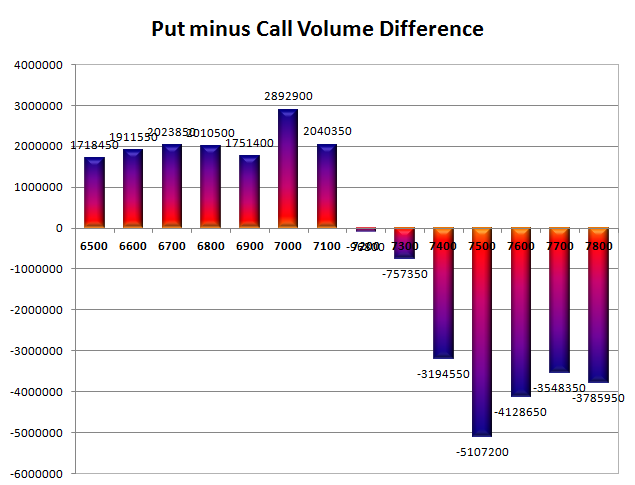 PCR Open Interest (Volume) has dipped to 0.879. 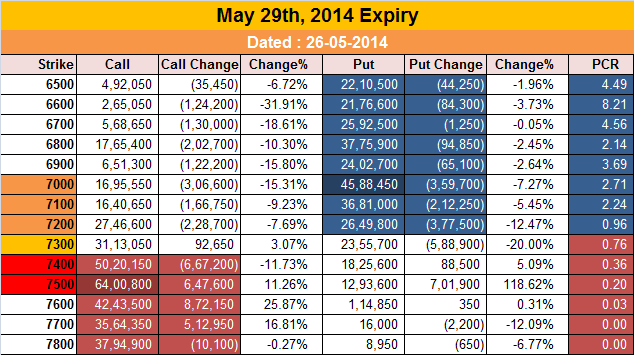 Initial support still at 7300, with OI of just 23.56 and below that at 7100 with OI of 36.81 lacs. 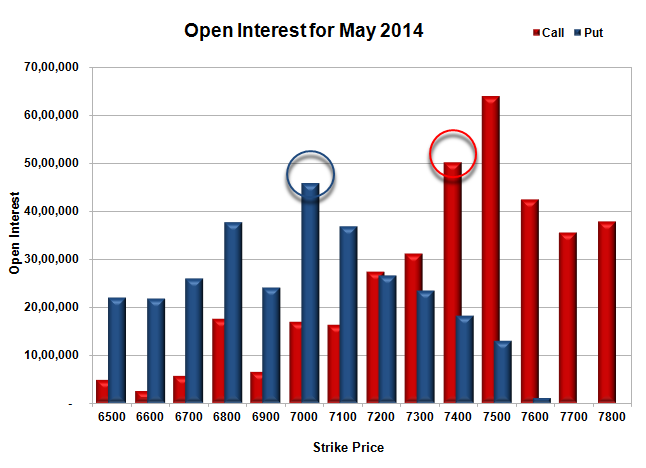 Initial resistance still at 7400 with OI of 50.20 lacs and above that at 7500 with highest OI of 64.01 lacs. Day Range as per Option Table is 7275 - 7467 and as per VIX is 7283 - 7435 with 7377 as the Pivot.